Valentine's Day and wine go hand-in-hand, making it the perfect choice for this special holiday! Personally, we love west coast wines and Oregon wineries offer some of the best in the country. Wine lovers will likely agree that no one does pinot noir better. 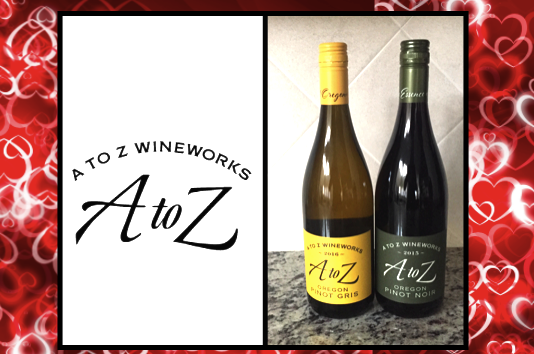 This Valentine's Day, we've chosen A to Z Wineworks Pinot Noir and Pinot Gris wine for both their high-end taste and affordability. 2015 was a near perfect vintage year in Oregon. This 2015 A to Z Pinot Noir represents the year well with delicious aromas of black cherries, blackberries, blueberries and raspberries all overlaid with an array of spices and scents such as tobacco, fennel and red currants. From the first taste, the description of this wine was spot-on. We love the complexity of the red and blue fruit flavors and floral notes, which compliment each other well. The richness of the fruit paired with earthy notes create the perfect finish. We were surprised to find such a well-developed wine with a price point of only $20! If you're looking to impress a special someone this year without breaking the bank, A to Z Pinot Noir is a winner. Looking to cook a special dinner that pairs well with this wine? A to Z Wineworks offers a delicious gourmet recipe: grilled duck breast with arugula and cherry gastrique! This platinum-glow wine has a delicious profile of honeysuckle, citrus, kiwi, and nutmeg, with a crisp, clean finish of wet stone and jasmine green tea. The aroma of lychee, beeswax and melon add to its complexity. We're especially impressed with the balance of fruit and mineral notes A to Z Wineworks has achieved in this pinot gris as well. It really pairs well with anything! At $15.00 a bottle, we're hard pressed to find anything better. It comes as no surprise that it has received 90 points and Best Buy distinction from Wine Enthusiast. I'm a picky white wine drinker, and this is one I would join a wine club for. Don't miss this gourmet pan roasted trout recipe from A to Z Wineworks as well! Check out the A to Z Wineworks locator to find retail and restaurant locations near you. You may even be able to enjoy same-day delivery...visit Drizly to see if this is an option in your area. Disclaimer: The products in this post were provided by A to Z Wineworks. As always, our posts are our own, honest opinions.